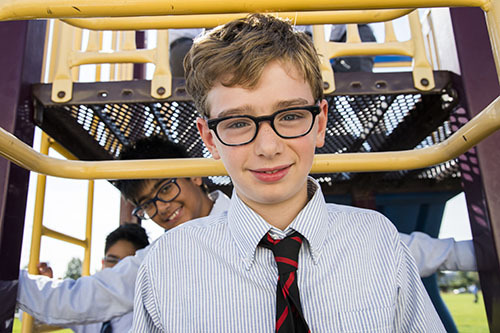 At Sterling Hall, we focus entirely on the educational experience for boys during their formative years from Junior Kindergarten to Grade 8. We put all of our best thinking, academic programming, innovative strategies and resources into boys’ learning at these ages. There is a wide body of literature supporting approaches for teaching boys that includes movement-based and hands-on learning. We incorporate best practices for teaching boys throughout our curriculum. In core subjects such as language and mathematics, learning is enhanced through interactive challenges, group-based problem solving and use of manipulatives such as hand-held puzzles and models, particularly for younger boys. Reading is effective in smaller groups that are teacher-guided – often involving books that appeal to a boy’s penchant for good versus evil, heroism, the graphic novel and an increasing interest in non-fiction works for young readers. Speciality subjects such as Health & Physical Education, Visual Arts, Music, Drama and Science, all incorporate hands-on, tactile and movement-based learning. Co-curricular clubs and extension programs such as woodworking, lego robotics and go-kart building all enable boys to explore hands-on, creation-based learning that we know boys thrive on. In the classroom setting, active learning may include completing work at stand-up desks, sitting on wiggle cushions or reading while balancing on an exercise ball. These activities allow boys to sustain their attention while appeasing their penchant for movement. We encourage boys to be active while they learn and we provide a variety of opportunities to appeal to different boys.